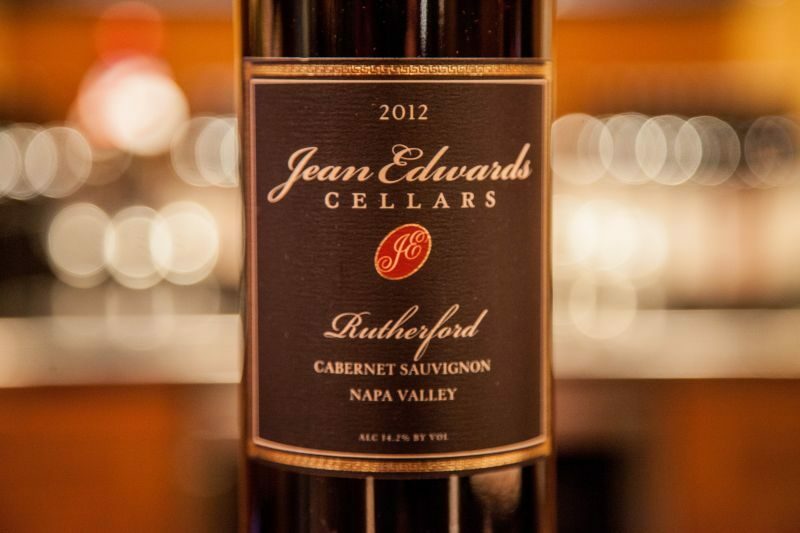 Tasting rooms in Napa Valley close at sometime between 4pm and 6pm, so do not offer opportunities for an evening drink. 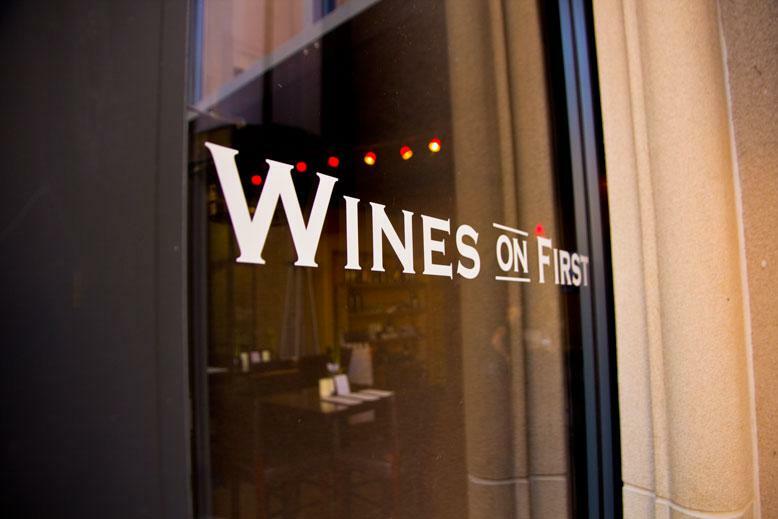 Wines on First, in a square off 1st Street in Napa, stays open until 11pm on Friday and Saturday. 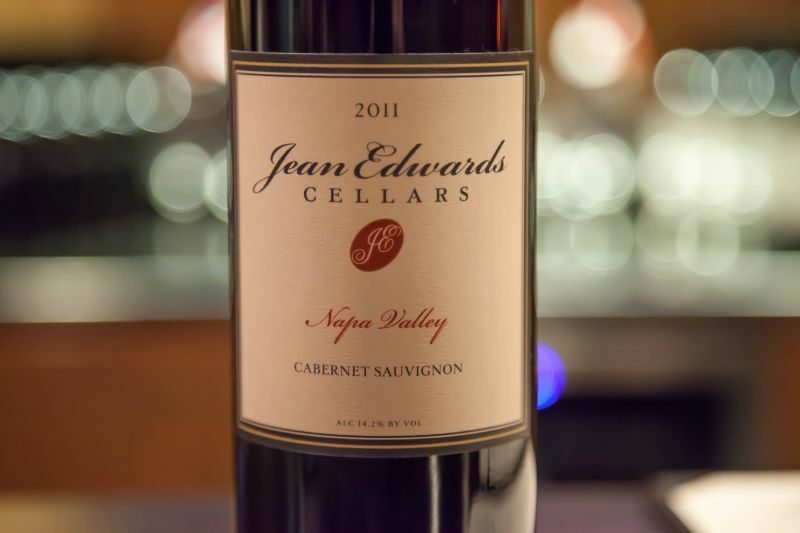 In addition to tastings, they also sell wine by the glass or bottle, giving the place a wine bar vibe. The final advantage is that they offer food from Oenotri, an Italian restaurant across the square; so you can have light snacks or a full meal with your wine. 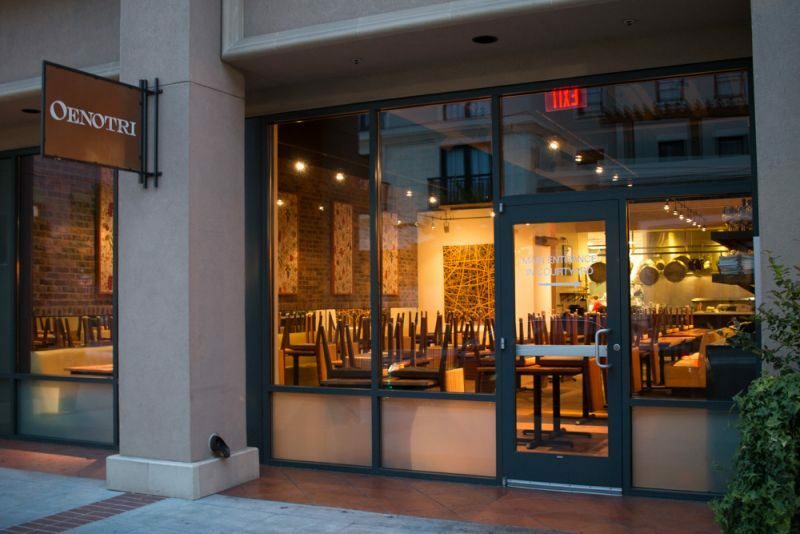 California Girl comments: Let’s say it again, great atmosphere, downtown location, and amazing food plus fantastic wine! Talk about a winning combination! This is a hidden gem that people need to take note of. The entire experience is remarkable. On a recent Saturday, California Girl and I went to Wines on First with our friends and occasional contributors to the blog; The Artist and The Alchemist. 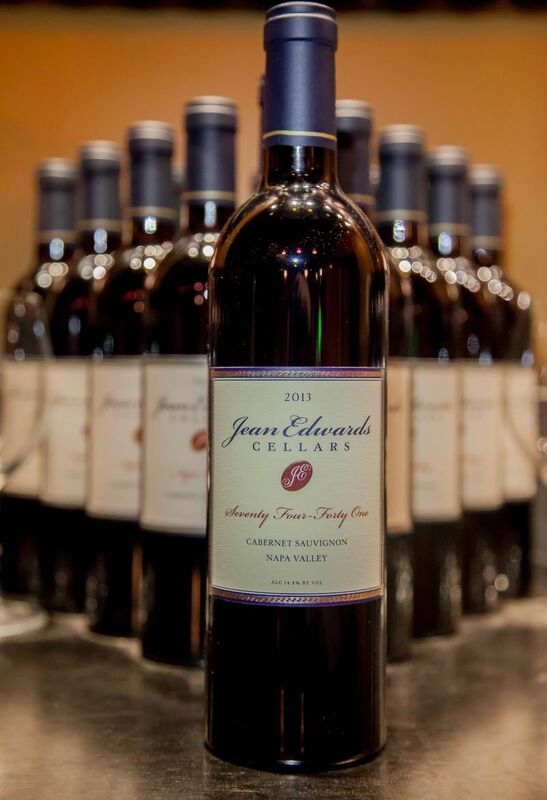 We started with a tasting of Jean Edwards wines; our favourite of the three wineries that share the tasting room. We ordered beef carpaccio and a funghi pizza to accompany the tasting. Our server would dash across the square to Oenotri to deliver our order. The beef carpaccio came with toasted walnuts and crisp leeks; an unusual, but texturally excellent, combination. 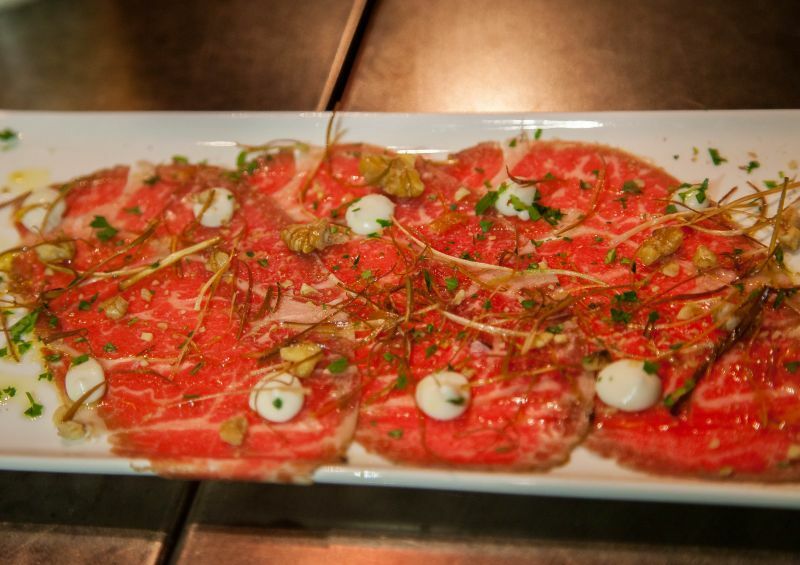 California Girl comments: I really enjoyed the carpaccio. I too thought it was texturally interesting. I absolutely loved the leek straws on top. It gave you that lovely crunchy onion flavor without taking anything away from the meat. There were also dollops of cream on the plate to give another layer of flavor. 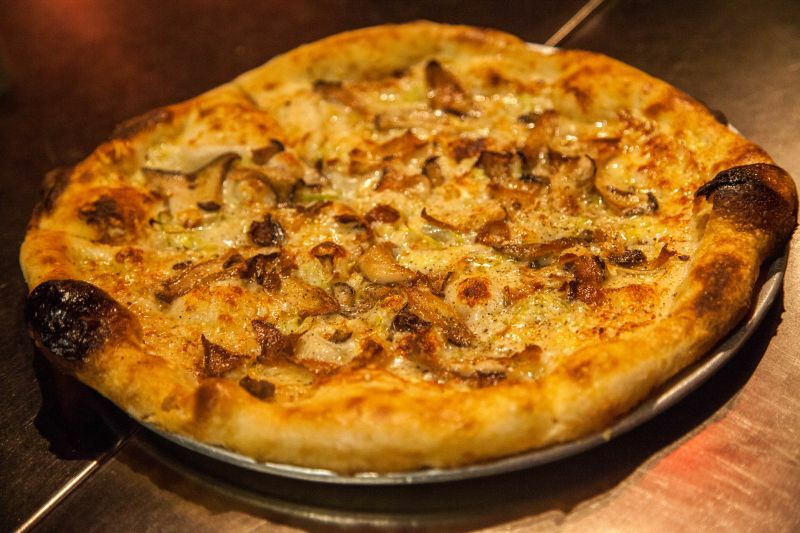 The pizza was stunning; a white sauce as the base with king trumpet mushrooms, shaved leeks, and black pepper. This last ingredient was used with great care; all to often pepper overwhelms the other tastes, but here it was an accent that added depth to a perfectly cooked, crisp, thin pizza. 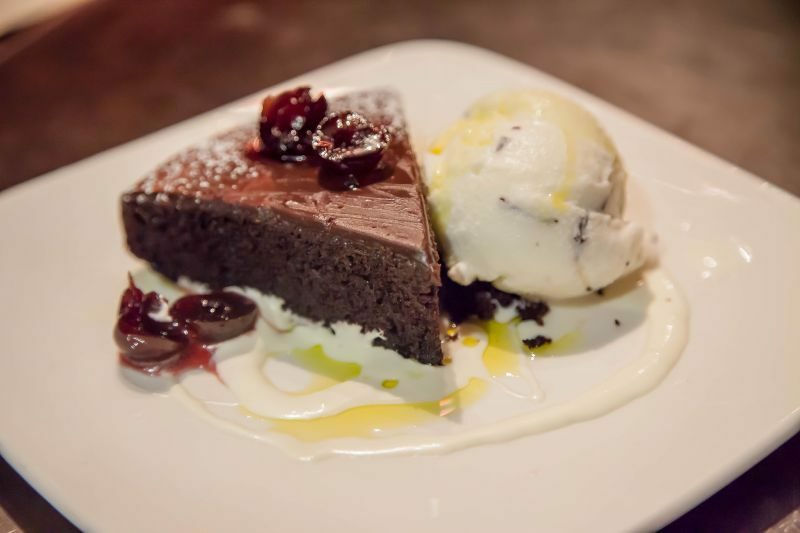 Sharing this between four, left us wanting more and so we ordered a second serving. California Girl comments: When the funghi pizza was ordered, I nearly objected. I really dislike it when restaurants over use the spice of pepper. The fact that pepper was mentioned in the description nearly sent me running. However, it was a WOW! The pepper, instead of being huge flakes of the stuff that gets in your between your teeth so you can’t get away from the flavor, was finely ground and perfectly executed. It enhanced the flavor of the pizza rather than it being the only overpowering flavor. The crust was a delight; crispy and light. The mushrooms were wonderful and exactly the right choice for the rest of the ingredients. Delicious. 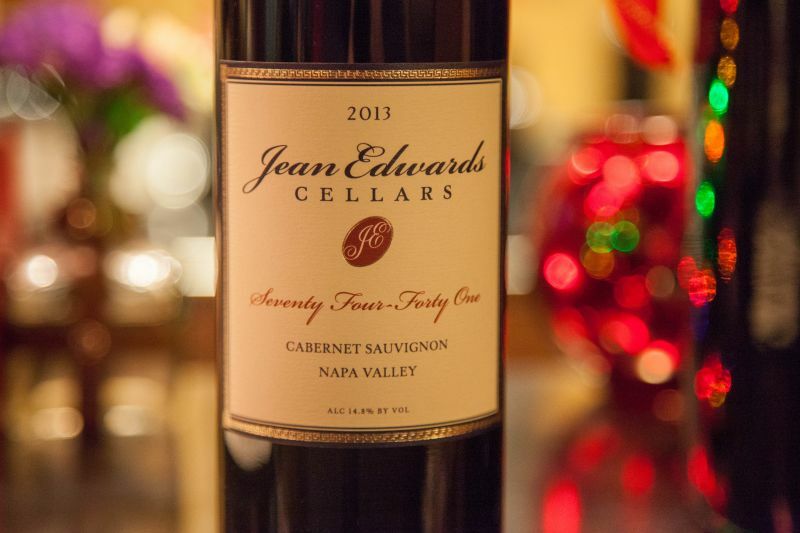 The tasting ran through a similar range of wines as we had when we had first tasted Jean Edwards Cellars, so I shall not repeat our thoughts on the wine. This evening, we reached a conclusion that the 2013 Stagecoach Cabernet Sauvignon was our favourite; with rich fruit on the nose and in the palate. California Girl comments: When he says the 2013 Stagecoach was our favorite, I can say that it only just edged out the 2012 for flavor. I also like their Seventy-four Forty-One. I am not sure which one I really prefer out of the two. More drinking and testing is obviously needed to figure it out for sure. I have to say that I even enjoy drinking their Sauvingnon Blanc. It’s light, fruity and pairs wonderfully with food. It’s very impressive considering I’m not a huge New-World Sauvingnon Blanc fan in general. I usually find them having too much citrus acidity and plain unappealing. That is not the case here. California Girl comments: One of the things that was so nice about this meal and the way it was set up is that we were tasting through the wines as we chatted and perused the menu for Oneotri. We ordered each thing one dish at a time to give ourselves the opportunity to really enjoy each other, what we were eating, and to feel satisfied. The meal was slow (deliberately slow) and we enjoyed our wine and food of the night dining rather than just eating. 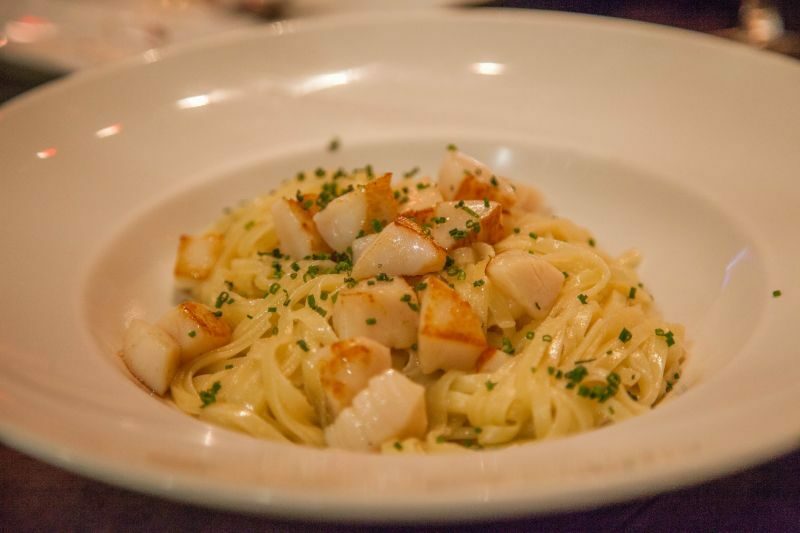 California Girl comments: Our next dish from Oenotri was the scallop linguini. There are so many things I loved about this dish. I think one of my favorite things was how they handled the scallops on the plate. That might sound like a weird thing, but think about how this dish is usually presented. Normally, you get four or five large scallops on top of your pasta. What happens is you cut the scallops in half, and so you get about ten bites of scallop when you have a huge plate of pasta. After the scallops are done, no matter how good the pasta is, you feel a bit let down and meh about the rest of the dish. Onoetri have fixed that in a very clever way which we all loved. They cooked the scallops to perfection and then chopped them up and tossed them throughout the pasta. Brilliant. This way you get more of the flavor of scallops throughout the meal. I give this a huge thumbs up. The linguini was cooked perfectly and I did like the flavor of the white wine sauce. If I am being picky here (and you all know I am) I would have liked a little more salt profile to the dish. A dash more salt, a bit of parmesan, or even a meat accent like pancetta, bacon, or prosciutto just to give the dish a star quality. The scallops in the linguini had a near perfect sear and were sweet and juicy; I agree that the pasta needed a touch more seasoning. 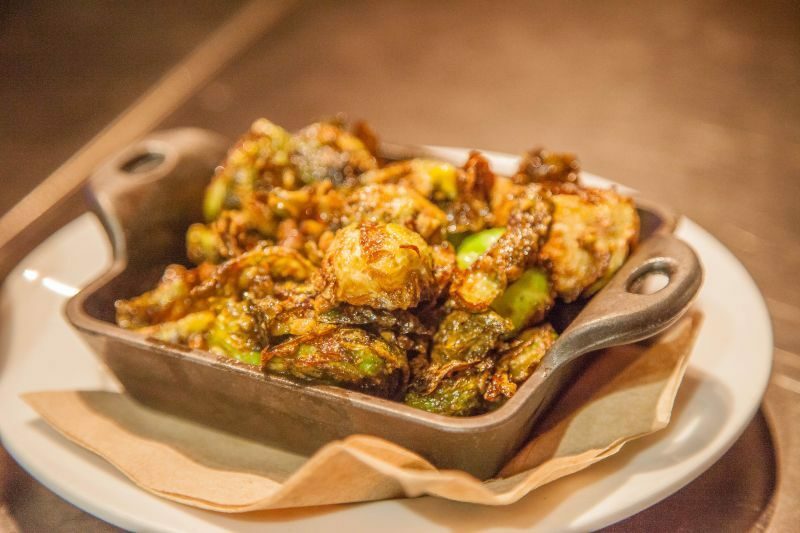 California Girl comments: We ordered roasted Brussel sprouts as a side dish with the linguini. They were delicious. Crispy and flavorful, perfectly seasoned, I could have eaten a whole plate of those myself. I tried a bite of Brussel sprouts; it did not change my dislike for this vegetable. The olive oil cake for me was just ok; it was moist and not too overly sweet. I really liked the addition of the black cherries to it as it added richness and depth. Those things always win me over. The flavor though just missed the mark for me and I was happy with my one bite. I was shocked though to see our friend The Artist who like me isn’t a big dessert eater, absolutely loving this cake. 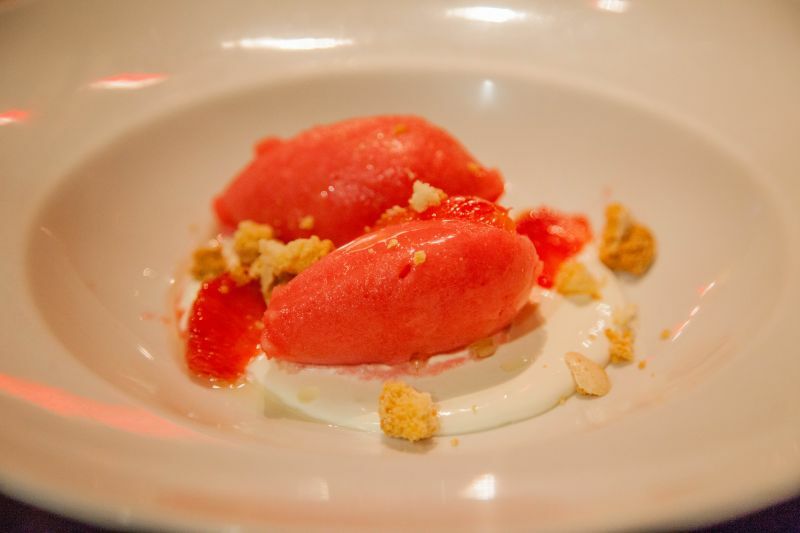 The blood orange sorbet, with slices of the fruit was excellent in its own right, but the addition of vanilla marscapone was a masterstroke; providing sweet creaminess to balance the sharp acidity of the sorbet. 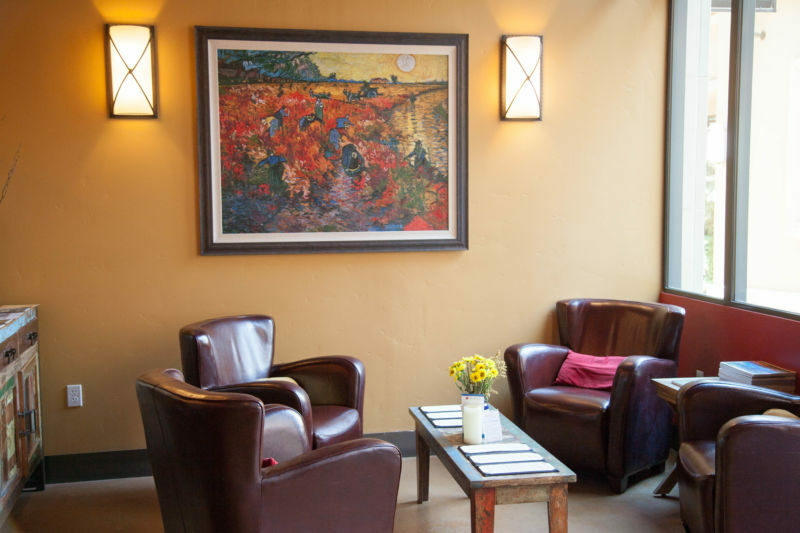 The combination of great wine, attentive service, and excellent food makes for a wine bar experience that hits all the right notes. At the end of the evening, you do have to pay two bills; one from the restaurant and one from “Wines on First”, but this is a minor hassle for such a lovely experience. California Girl comments: This tasting room experience has it all which is why we named it in our 2016 favorites list. We highly recommend you place Wines on First and Oenotri on your Must Visit List for 2017. Everyone has to make a New Years resolution right? Every time I read your posts I learn something new. We’ve eaten at Oenotri several times but never tasted at Wines on First and certainly didn’t know that you could order Oenotri food. Another cool place to go. Maybe that’s where we can go together?